Guy has traveled over 150,000 miles across America’s back roads in Diners, Drive-ins and Dives in search of the best regional fare. 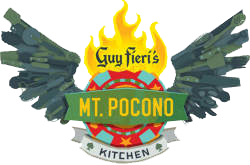 The menu at Guy Fieri’s Mt. Pocono Kitchen reflects his signature style of authentic and surprising flavors. Guy knows American food to the core. The dishes are crafted with the heart and soul of hometown favorites and infused with Guy’s big, daring flavors. You will find beloved comfort food with a spin only Guy could have envisioned. Hope you’re hungry, because Guy’s imagination knows no boundaries. Date of Availability: Open 24 Hours.